If you think it takes a lifetime of indoctrination and training to become a Muslim Jihadist murderer, you would be wrong my friend. 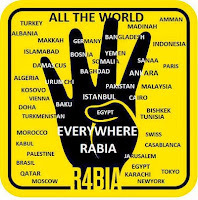 Oh the big hand… it’s the new symbol of the Muslim Brotherhood, that’s the Islamic terrorist group that your Secretary of State Rex Tillerson supports. 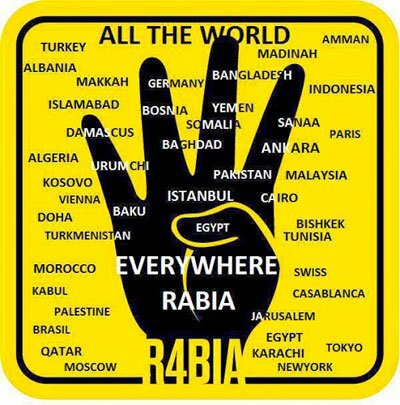 And if you think that these terrorist training camps exist only in the Middle East, you would be wrong again! A-N-D… if you think the current’ Muslim Jihadist Terrorists are barbaric, brutal, evil and demonically possessed ‘then you haven’t seen nutin yet,’ my friend. includes the U.S. and Europe) indoctrinated with Islamic Ideological concepts from birth, and viewed by its Jihadists trainers as better and purer than themselves, according to the first study of trafficking, exploitation and abuse of children as a means of securing the future of the Nation of Islam. Researchers for Quilliam, a London counter-extremism thinktank, have investigated the way Islam recruits children and indoctrinates and trains them for jihad. The Children of Islam, was compiled through a study of propaganda released by Sunni Muslims featuring children and networking with trusted sources within the training camps. The portrait painted is of Jihadists eager to enlist children to help safeguard its future. Many are being trained as spies, preachers, soldiers, “executioners” and suicide bombers. 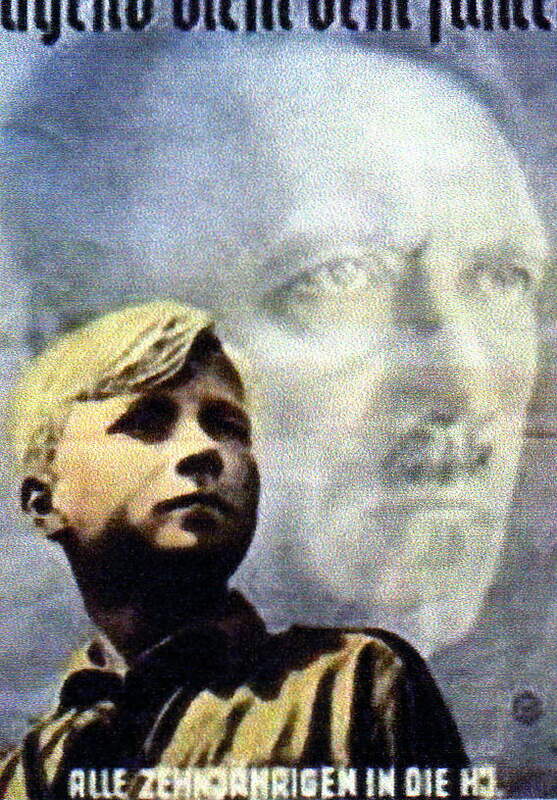 The organization focuses a large number of its efforts on indoctrinating children through a brainwashing education curriculum, and fostering them to become future and sometimes current terrorists. The current generation of fighters sees these children as better and more lethal fighters than themselves, because rather than being converted into radical ideologies they have been indoctrinated and brainwashed into these extreme values from birth, or at a very young age, as young as 3-4 years young. Not having been so-called corrupted by living, according to secular values, they are considered purer than adult fighters. “These children are saved from corruption,” states the study, “making them stronger than the current Mujahideen [Jihadi fighters] because they have a superior understanding of Islam from youth and from school curriculum and are better and more brutal fighters as they are trained in violence from a very young age”. The aim is to prepare a new, stronger, next generation of the Mujahideen, conditioned and taught to be a future resource of murders for the group. The area of most concern is that Islam is preparing its army by indoctrinating young children in its schools and normalizing them to violence through witnessing public executions, watching Islamic State videos in media centers and giving children weapons. The focus on youth bears similarities to the forced recruitment of child soldiers in Liberia in the 1990s, when Charles Taylor seized power in 1997 with a rebel army filled with children. Baathist regime in Iraq, which in the late 1970s established the Futuwah (Youth Vanguard) movement with the most important Iraqi child soldier units known as Ashbal Saddam, or Saddam’s Lion Cubs, made up of boys aged 9 to 15. ISIS also uses children to try to normalize brutality, with the group encouraging children to hold up decapitated heads or play football with them. In the past six months Islamic State propaganda has depicted 12 child killers. A macabre recent video showed a four-year-old British boy apparently detonating a car bomb, killing four alleged spies trapped in the vehicle. Jihadists have been quick to seize control of the education system in Syria, Iraq, Libya and Gaza as well as in the U.S. with indoctrination beginning in schools and intensifying in training camps. In the camps, children between the ages of 5 and 15 are instructed in Sharia, desensitized to violence, and taught specific skills needed to serve Alllah and take up Jihad. THE BOTTOM LINE: Earlier I stated that these terrorist training camps are not just in the Middle East…because we have them right here in the U.S. 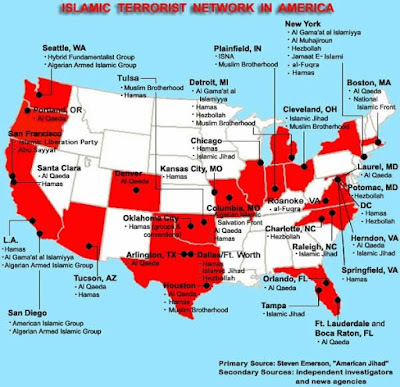 Moreover the map above shows only the actual Jihadi terrorists training camps in the continental U.S. and not the thousands of schools all over America that prepare your kids by indoctrinating them with the ideologies of Islam. And the question in your mind right now is likely…Doesn’t our government know about this? Of course they do. They are ignorantly complicit in the willful deception. If you think you are ready to handle more - then watch a couple of videos of the children being trained to kill you. I feel I must warn you they are graphic, the second one involves a child cutting a man’s head off. If you are not ready to watch these, both of them, then you are not ready to learn the whole and complete truth about the future that you are facing my friend. And all this with the promotion and protection of the U.S. Shadow Government.